Tuesdays might just be my new favorite day! Every Tuesday during the summer there is live music in the big park a few blocks from my old house in Healdsburg. Right when I left things started to become really cool there. What gives? Why did I move again? Oh yeah, to be closer to Target. I remember now. Music in the park is actually quite the outing and last week there had to have been hundreds of people there. There’s dancing, drinking, eating, frolicking…. People pack picnics and bring wine and it’s just a really fun time. I went last Tuesday but forgot my camera. Tonight I will try to remember. It’s hard sometimes when wines involved. 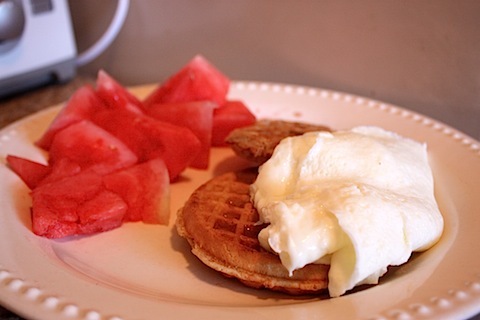 This morning I had a late breakfast of waffles with egg whites and maple syrup and…watermelon! It really wasn’t that photogenic but I promise it was good. I love me some watermelon and often times feel like I gain at least nine pounds in water weight because of it. I went to the gym for legs and cardio and then ate some lunch. Have I been eating a lot of tomato soup lately or is it just me??? I’m full on addicted to Trader Joe’s tomato bisque and it’s even better topped with creamy goat cheese. On the side I had a bell pepper and hummus and some iced Tazo Passion tea with agave. I keep a big pitcher of this stuff (I make it myself) at all times in the fridge and often add a splash of POM juice to it for a fruity twist if I’m feeling frisky. Murphy’s law!! Can’t wait to see pics. Music, food, and drinks in the park on warm summer nights is definitely top 5 awesome things about summer. Robyn @ Frugal 'n' Fit! I bet the pictures get more creative when wine is involved! Oh my God – that’s totally what I thought!! Haha I think I would move to be close to Target, too! Have fun tonight! Wow, is it really chilly enough there for a sweater or is that an old picture? I miss sweaters and jeans!! hahaha that photo was taken last November! ooo! I am a huge fan of the Passion tea both hot and cold. Do you use the ‘iced’ teabags or the regular. If you use the regular, can you tell me how you do it. I am struggling with the correct balance. Thanks! 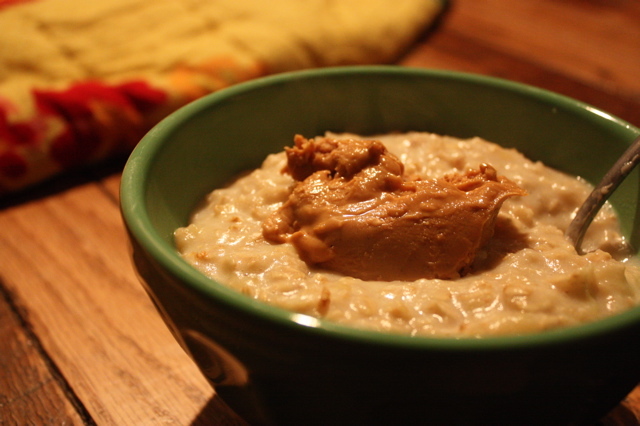 I am in love with Amy’s creamy tomato bisque…I could take a bath in it. Actually, that might be kind of gross. But it could be good for my skin! Thanks for the tip! I got a bunch of POM and looking for creative ways to use it! Have fun tonight! Can’t wait to see the pics! love the pictures of the mountains! do you find it hard adjusting to mountains? well, these are more hills than mountains (although when I first moved here I called them mountains, too). The biggest difference is when I’m running or riding my bike outside…MUCH different than the flat, flat Florida land I grew up on! I love it though! Ooh, I’ve never tried Trader Joe’s Tomato Bisque! I’m making a trip there this afternoon, so I might have to pick some up! I bet it’s amazing topped with goat cheese! I think moving closer to Target is always a good idea! I feel like I’m there all the time!! Everything is better with goat cheese. I like it in my eggs too. I often forget things like being a responsible blogger when wine is involved too. Happens to the best of us! mmmm trader joes tomato bisque is the best, always well enhanced by the addition of cheese. Oh that’s a really good idea – the POM with the tea. oooh have fun tonight! Sounds like a great outing! The good news is that watermelon is actually a diuretic! 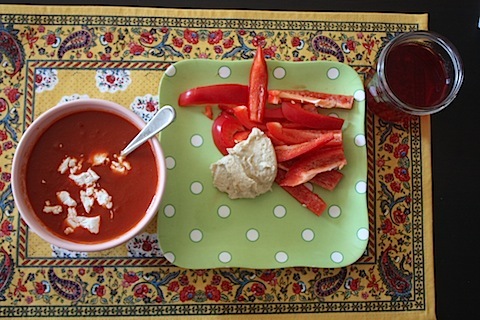 I have never considered adding goat cheese to tomato soup… yummy! I love downtown fun. Our local downtown has movie night in the summer on the town hall lawn. I know you love the South. I’m in Charleston until Sat. ( mother/ daughter trip). I was wondering if you (or any ELR readers) could recommend some must see places or restaurants! Thanks! All I do is boil a tea kettle full of water and then fill my pitcher with it + 4 tea bags and a big squirt of agave. After about four minutes, I take the tea bags out and just put the pitcher in the fridge overnight. I don’t use ice because I don’t have an ice maker! Just FYI- you can skip the boil step, I swear! I put tea bags + COLD filtered water into my pitcher every night, put the pitcher in the fridge, and have tasty tea in the morning. And I use regular old tea bags, not a fancy “iced” kind. I do, however, use ~ 4bags per cup of water. i thought i was the only one who also loves that tj’s tom. soup ;P sometimes for extra staying power i cook up a serving of tj’s whole wheat couscous and top it with goat cheese (like you) and black pepper… just thinking about it is making me hangry! I love the idea of a festival, oh i want summer back. I’m jealous of your TJ’s. We need one in Australia, oh & Wholefoods too. I am visiting CA from TX and was wondering if you knew of any farmer’s markets in San Francisco on saturday morning?? Love your blog….yours was the first that i ever read and have followed it ever since! I’m from SF and can absolutely recommend the one at the Ferry Building on the Embarcadero. It is famous around the country. You can take any number of public transportation lines there. Really fun! And gorgeous setting. Love community live summer music nights–lots of it all around the SF Bay Area. 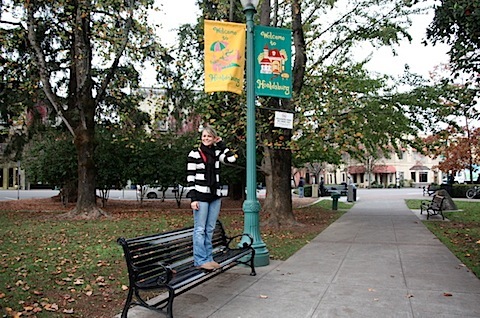 Sounds like a lot of fun in Healdsburg! i seriously ate 1/4 a watermelon last night and stepped on the scale and HAD gained. lol. crazy. i then peed all night! Hey, didn’t I take that photo!? !